Backwoods Cigars are the world’s number one natural cigars. These machine-made cigars are high in quality and known for their rustic appearance. They are perfect for those who like to spend time outdoors. Smoke these while being surrounded by nature and experience true happiness. 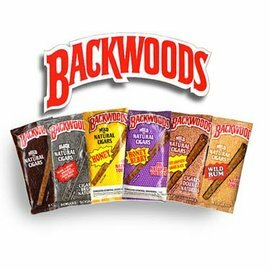 Backwoods Cigars come in attractive packages and the cigars themselves look distinctive. Their wild look comes from their frayed ends and tapering bodies that have unfinished heads. This masculine look is further enhanced with top-notch Indonesian wrappers. These cigars are packed with fully natural, high-quality fillers. And many of these mellow tobacco blends have been infused with delightful flavors. Backwoods cigars are a product of Altadis USA. This classic unbound cigar has been around for what seems to be forever… and continues to offer the very same smooth taste it’s been known for from the beginning. And with a variety of different flavors available, you can choose exactly what you're in the mood for. From the classic original cigar to its more contemporary flavorful cousins, and from 5–packs to 3–packs to Singles, every Backwoods cigar combines the best leaf wrappers.